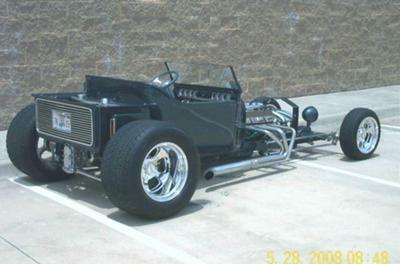 World's most expensive and unique T-Bucket. 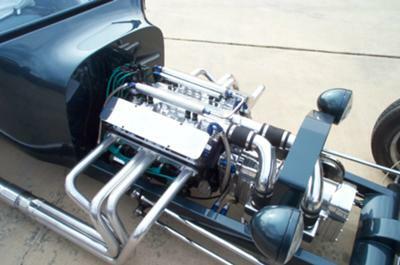 FRAME: Don Ross custom, 2x4 tubing, wiring and water hoses inside frame. Front crossmember houses rack and pinion steering. BODY: CCR fiberglass, stretch version, modifications by Steve Muck and Don Ross. Bed lid opened by Dakota Digital linear actuators. FRONT END: Speedway tube axle and leaf spring, Magnum backing plates, Wilwood discs and spindles, Don Ross custom 4-bars, Honda Civic rack and pinion. Mumford linkage. Hoosier radials on Budnik 15x7 Famosa wheels. REAR END: bite your tongue; not Jag, not Corvette, it's a rare Halibrand quick-change IRS, 4.11 limited-slip differential, Wilwood inboard discs, 4 Alden coilover shocks. Hoosier radials on Budnik custom 17x13 Famosa wheels. INTERIOR: custom dash insert by Don Ross, Autometer gauges, Budnik wheel, Mullins column. ELECTRICAL SYSTEM: by owner, main panel behind interior firewall, connectorized to wiring inside frame rails. GM CS100 alternator driven by driveshaft. Optima yellow-top battery, relays and other circuitry under seat. COOLING SYSTEM: custom crossflow radiator behind Don Ross tailgate grill, dual electric fans and Dakota Digital PAC-2000 fan controller. Reverse water flow, Jabsco electric water pump, hoses in frame. 3.5 gallons of distilled water and 2 bottles Red Line Water Wetter. 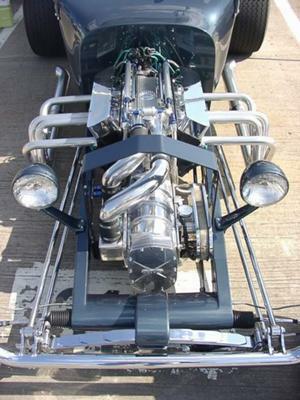 FUEL SYSTEM: custom tank by Don Ross. SX billet pump, filter and boost-ref regulator. ENGINE: by Dave Plubell, 355 SBC, World heads, Speed-Pro 7.5 pistons, Crower cam, Scorpion roller rockers, 6-71 blower by BDS, Potvin drive. Port EFI by owner with Cutler throttle body, Lucas injectors and Haltech F10X ECU. Mallory MaxFire programmable distributor. B&M Holeshot converter, TH400 transmission, Sanderson headers. This guy is BOTH a little crazy and a genuis!!!! He ain't heavy, he's my brother!! If you ever get a chance to study this car, do so. For a long time. It is so unique yet flows beautifully. Techy yet very much a T bucket. The plastic fish in the clear overflow tank gives you an idea of his sense of humor as well. And he ain't afraid of road trips. It's a cruiser. In my opinion, one of the very best buckets ever built and he treats it like an ongoing project in bucketania. ( That a word ?) Always progressing as it should be. Is a hot rod ever really finished? The designer must be a genious or just crazy. Coolest bucket. Only car I've seen with a street able Potvin drive.